FabLabs are meeting sites where numerous machines are available for use by individuals, giving them the ability and the possibility to create almost anything. There are different kinds of FabLabs, some just slightly related to the concept created by MIT. Most of them renamed themselves ‘makerspace’ or ‘hackerspace’ Even if most are just universal machines, others have sought to differentiate and specialize their offer. That’s the case of the Digital Fabrication Lab created by the College of Environmental Design at UC Berkeley that only gives students CAM machines. On the other hand, TechShop contains all types of equipment and tools from jigsaws to waterjet machines, allowing its members to work with wood, metals, but also plastics and textiles. TechShop does not only give access to machine tools, but also computers and software programs. Even though the machines are slightly differentiated from one another, most FabLabs are managed the same way. FabLab members are taught how to work the machines, especially the most dangerous and expensive ones. Going forward, autonomy is commonplace even if certain machines always need members to be supervised. – The spaces managed like companies and that aim at being profitable. The most visible example of this type of structure are TechShops. The first TechShop opened in 2006 in Menlo Park and has since expanded rapidly in the rest of the United States. – The spaces opened by associations. Generally less structured, these spaces are open to a larger audience including children coming to discover the tinkerers’ world as well as older people looking to lead personal or professional projects. That’s the case of SHARED SF and Hackerspace. – The spaces managed by universities and schools. These spaces have an educative intention before all. Thus, the Digital Fabrication Lab allows students to produce their projects and allows professors to lead their research initiatives. Managed only by three people, 400 people use the lab each trimester. The structure and functionality of TheFoundry@CITRIS is interesting. The Foundry was created at UC Berkeley two years ago. Its goal is to help students develop their projects and find a market for them. Apart from the access desks at The Invention Lab, The Foundry offers a network of mentors and investors. The Foundry is now creating partnerships with other UC Berkeley departments to have a greater degree of project diversification with an aim to profit off the expertise of each department. TechShop has also chosen partnerships to continue its development, but for different reasons. In fact, three to six million dollars are necessary to create a TechShop. This is why new locations are established with partners. In Texas, TechShop is associated with Lowe’s to encourage clients to use their purchases on site. In Arizona, TechShop is associated with Arizona State University. The objectives of FabLabs are varied and this is what makes the ‘Maker’ movement so strong. Nevertheless, we can define three different profiles that cover the majority of the population using FabLabs. – The professionals who are launching their business or manage a SMB but in which the needs and resources are limited. FabLabs give people with ideas the possibility to put those ideas into execution. Thus, some SMBs continue to work with TechShop to avoid investing in larger machines. – The prosumers or hobbyists who generate little to no revenue based on their activity in FabLabs. Nevertheless, they take advantage of their technical competence to create or do up objects. There are, for example, people at SHARED SF who make furniture or create objects for their houses. 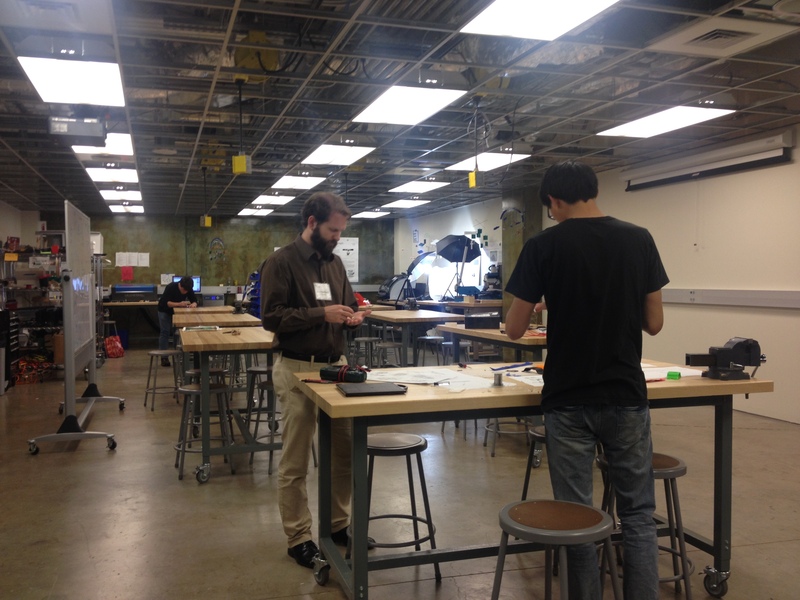 – The novices who go to FabLabs to try new activities. In particular, the « young » retirees use the machines to express their creativity. In conclusion, FabLabs are the libraries of tomorrow: people will come to teach themselves and to create new knowledge and know-how. The same way the very first computers were accessible only in libraries, the first 3D printers are located in FabLabs. FabLabs are a way of awareness-raising and of diffusion of the « maker » culture, allowing each to give shape to their ideas. They allow the creation of businesses that then must increase from FabLabs. Although there are only few success-stories (one of them being SF-based DODOcase company), the dynamic movements of crowd funding should help speeding-up the transition from prototype building to manufacturing of commercial products in very short cycles.